The remains of K-Pop star Kim Jonghyun was carried out of the Asan Medical Centre in Seoul by some of the biggest K-pop stars today. The remaining members of SHINee and three others from fellow SM Entertainment-managed K-Pop group Super Junior were seen carrying the coffin of Jonghyun to a limousine outside the Asan Medical Centre hospital building. 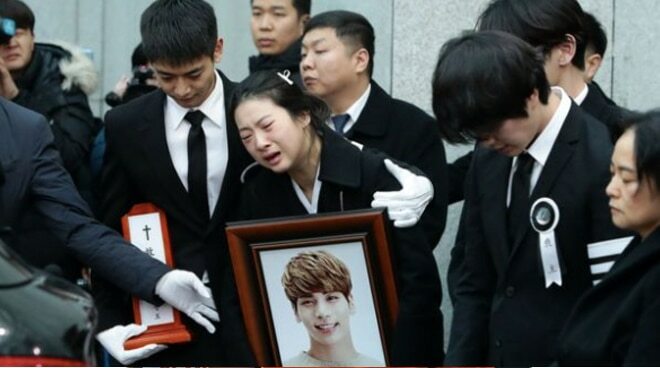 Jonghyun’s sister, who was seen leading the funeral walk, held a photo of him in a wooden frame. Kim Jonghyun died at the age of 27 due to an apparent suicide. Nine9 of K-Pop rock group Dear Cloud released a suicide note written by the South Korean idol before his sudden death last Monday, December 18.